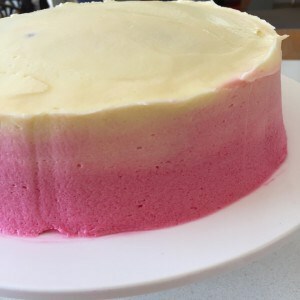 Ombre cakes look a bit tricky but they actually aren’t. The different colours can be piped into rosettes but if you don’t fancy doing flowers, this way is quicker and easier. You can of course use any kind of cake you like, and fill and decorate as you wish. When strawberries are in season I like to sue them, and I think their sweet tartness cuts nicely through the butter icing. 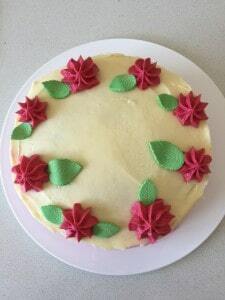 If you don’t have a piping bag and nozzle, just make 2/3 of the buttercream and cover the cake with that, tinted to the colour of your choice. 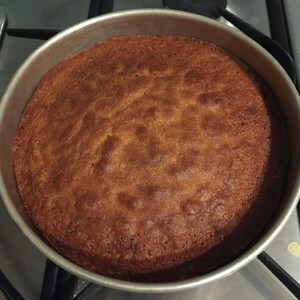 Grease and line a 20 cm cake tin, and heat the oven to 180 degrees C. Cream the butter and sugar together, gradually add the eggs then mix through the remaining cake ingredients. Pour into the tin and bake for about 50 minutes or until cooked and nicely browned on top. Allow to cool. 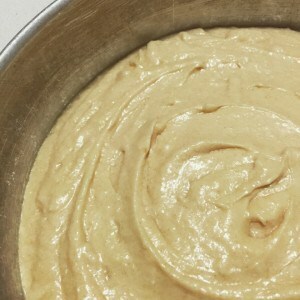 To make the butter icing, beat the butter for quite a while, until very pale and almost white. Add half the icing sugar and mix well. Add all the milk, mix, then add the remaining icing sugar. 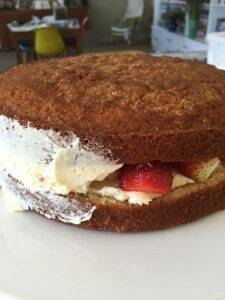 Split the cake in half, place some of the buttercream on the bottom half and spread evenly. 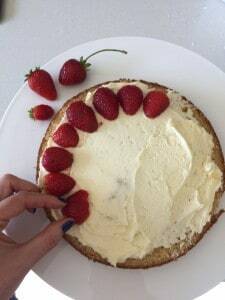 Top with strawberries if you like, then place the other cake half on top. 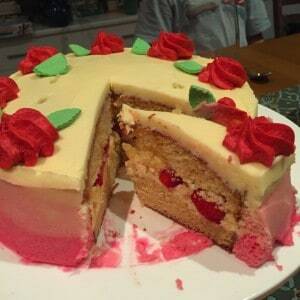 To give the cake a really neat finish, you can do a crumb coat. Look it up on YouTube but basically you cover the cake in a thin layer of the buttercream, then place in the fridge for a little while to set. This coating picks up any loose crumbs and prevents them from appearing on your nice finish. 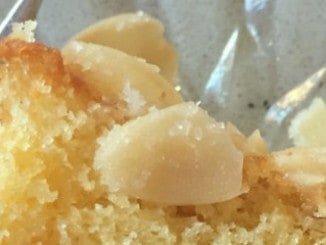 While the crumb coat is setting, tint the icing. If you like you can make the first layer white, or you can do 3 deepening layers. It’s easiest to start with white/the palest colour on the bottom. Place a large nozzle in the piping bag and fill with about a ¼ of the first colour. Pipe a circle around the edge/base of the cake. It can be rough, as it will all be smoothed out shortly. Tint the icing a bit darker and do a ring of this new colour on top of the palest one. 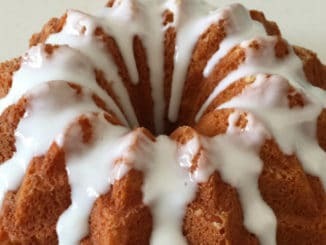 Repeat a third time with the remaining icing, and also spread this icing over the top of the cake. Using a spatula or metal palette knife carefully smooth out the rings of icing. You want to blend the colours a bit, but also see the different shades. Smooth the icing on the top. 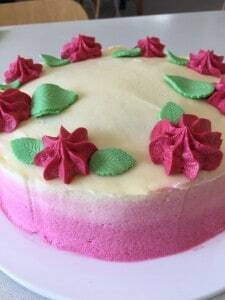 To get a really good finish rest the palette knife in a cup of boiled water, wipe on a paper towel and, working quickly, smooth the icing with the hot knife. 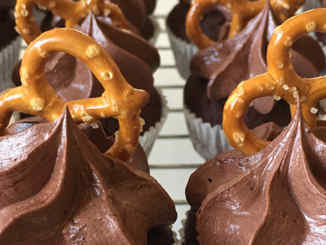 Repeat as many times as you need to, being sure to wipe off all water before touching the icing.